I'm new to Subversion Integration in IntelliJ. not shown in browse changes ? C> I'm new to Subversion Integration in IntelliJ. >> C> I'm new to Subversion Integration in IntelliJ. >> C> over time ? >> (when you select a particular revision). I would like to second this. I provided feedback on this in the beta, but didn't hear anything about it. Currently, the Browse Changes feature with Subversion is a bit of a joke. It's fortunate that TMate still works with IDEA 6. TMate does a great job with this, much nicer than IDEA 6 -- what's the deal there??? I hope that TMate is continued or, even better, rolled into IDEA. I guess the problem is TMate is CVS/SVN-specific, while you are trying to make VCS support more generic? In any case, TMate is a model of user-interface design. John - instead of leaving it at "is a bit of a joke" - any key areas you're finding it lacking? Any links to JIRA tickets about improvements at all? I have a small list of usability issues I have accumulated over the past few weeks, and I have been meaning to post them in some form. The trouble is, I find it takes a lot of time to do that properly. I feel I need to search through the forums and JIRA, to avoid wasting other peoples' time. 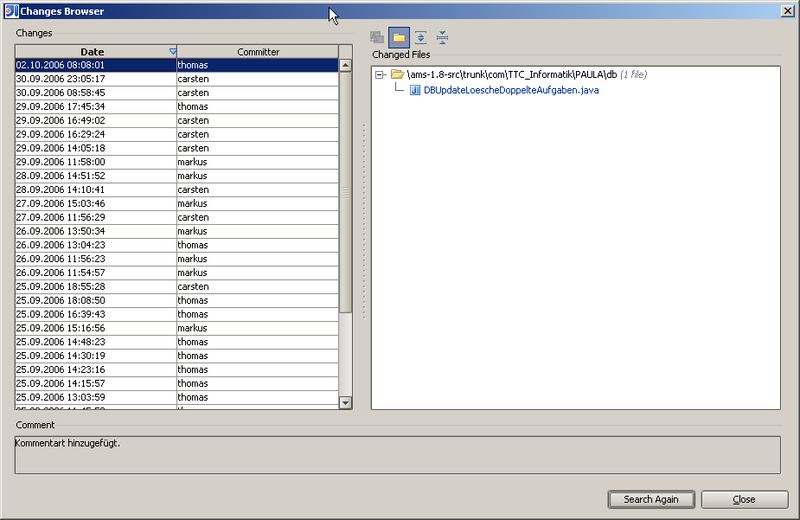 And in the past when I've tried to do this, I found I still created duplicate entries, so I got a bit discouraged. Sorry not to be more constructive. JH> beta, but didn't hear anything about it. JH> past few weeks, and I have been meaning to post them in some form. JH> found I still created duplicate entries, so I got a bit discouraged. Thanks for your encouragement, Dmitry. I hope I can get my list of usability issues posted shortly. I did notice today that many of my issues have in fact been fixed by now. Well done. I am pleased to hear there is more enhancement planned for 6.5. I do think a lot of the new VCS interface is great, and I should have said so. Rolling more TMate-style functionality in will only improve things.